UN peacekeepers are often deployed when there’s no longer any peace to keep. In the current strategic environment of non-state actors, peacekeeping has also become increasingly complex and non-traditional in character. Despite those new challenges, we rarely hear about UN peacekeeping operations in Africa, as the news is dominated by the Middle East. It’s now time for strategic decision makers in the West to appreciate why Africa matters. Of the 16 current PKO missions , nine are on the African continent. Of the roughly 100,000 uniformed peacekeepers  currently deployed, 82,000 of them are based in Africa. Those statistics are significant because terrorist organisations—like the so-called Islamic State (IS)—thrive in unstable and insecure environments. Those are the same places that typically require UN peacekeeping operations. That situation will become even more apparent once the IS caliphate is reduced in the Middle East and the group looks elsewhere for safe havens from which to train and launch attacks. In the future, peacekeepers need to be capable of conducting the full spectrum of peace operations, from humanitarian assistance/disaster relief operations through to missions with a more offensive mandate. For example, the current MINUSMA  operation in Mali requires more of a counterinsurgency mindset  than a traditional peacekeeping approach. But the problem is that many UN peacekeepers are neither trained nor equipped to deal with evolving threats in the contemporary operating environment. Of the 100,000 peacekeepers currently deployed, just 39 are Australians . Yet the Australian Defence Force (ADF) has more than 2,300 troops deployed  on operations elsewhere around the world. Coalition operations, such as those in Iraq and Afghanistan, are seen to more directly serve Australia’s defence interest  of maintaining a rules-based global order. If there was an urgent need for UN intervention in Southeast Asia, however, we’d likely see Australia playing a leading role. In balancing ways and means to achieve its national security objectives, Australia—as the world’s 12th largest economy —provides more funding than troops for peacekeeping operations. Notably, Australia is the 11th largest financial contributor  to the UN peacekeeping budget and the 9th largest donor  to the UN peacebuilding fund , which serves to prevent conflict in fragile states. Within our region, the peacebuilding fund is currently supporting peacebuilding projects in Myanmar, PNG, Solomon Islands and Sri Lanka. Within the UN’s Peacekeeping Capability Readiness System , Australia has pledged the use of C-130 and C-17 aircraft for strategic airlift, capacity building for troop and police contributing countries, and counter-improvised explosive device (CIED) training. At the September 2016 UN Peacekeeping Defence Ministerial Meeting in London, Defence Minister Payne announced additional funding of $1.2 million over five years  to further enhance regional UN peacekeeping capacity. That’s is a noteworthy contribution given Australia’s strategic interests, but Africa deserves more attention. It’s important to Australia for several reasons. Firstly, Australian companies have billions of dollars invested in Africa —an investment surely worth protecting. Secondly, just as in the Middle East, we have a moral obligation to protect civilians, particularly women and children in conflict zones. We can’t stand by to allow another Rwanda-like genocide to unfold in Africa. Prevention requires positive action. Thirdly, the US military has steadily increased its military presence in Africa  as a result of growing instability and the rapid expansion of terrorism on the continent. We live in a complex and interconnected world and the terrorism phenomenon is a global threat that will have consequences here if sanctuaries are allowed to exist over there. UN peacekeeping operations also provide our service men and women with valuable operational experience. I’ve benefited greatly from serving on UN peacekeeping operations in East Timor (UNTAET) , Lebanon (UNTSO)  and Sudan (UNMIS) . UN missions enable a unique and diverse perspective, different from other coalition operations. Australia can do more. Our service personnel are highly effective trainers who are building partner capacity  all over the world. The ADF’s Peace Operations Training Centre  (POTC) already trains hundreds of peacekeepers from more than 50 countries every year, but the Centre should be better resourced to increase its rate of effort. POTC should be expanded to become an international centre of excellence for peacekeeping operations. Additionally, the UN needs to better harness technology in peacekeeping to improve early warning and enhance the ability to detect, deter, mitigate and respond to threats, particularly in an asymmetric environment with non-state actors. Developed countries—like Australia—can contribute more to PKO in the future by providing niche capabilities, like drones, CIED and intelligence sharing. It’s time we think big picture, look strategically and anticipate future threats. The problems in Africa won’t be fixed overnight. We’re likely to see further atrophy before improvement. As such, terrorist organisations will look to the African continent for opportunities. 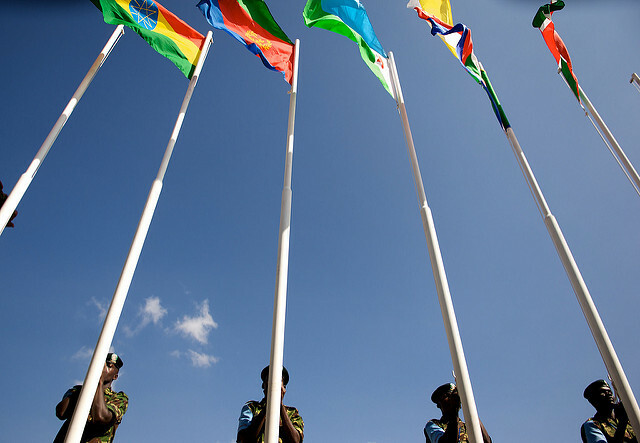 From peacekeeping to counterterrorism, Africa matters. Ash Collingburn is a visiting fellow at ASPI’s Counter Terrorism Policy Centre. Image courtesy of Flickr user US Army Africa.